The Museum of Islay Life is a superb museum for and about Islay and an essential port of call for anyone visiting the island who wants to understand the many facets of its story which are not just about whisky: though an illicit still does feature among its exhibits. 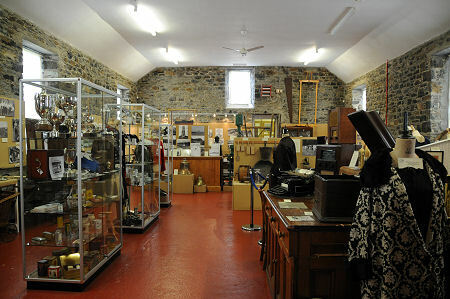 The museum was established by the Islay Museums Trust in 1977. 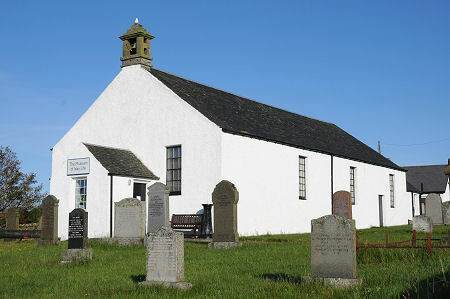 It is housed in what was originally built as the Kilchoman Free Church in 1843. The church ceased being used for worship in 1929 and had stood empty for half a century before it was identified as the ideal location for the museum. It was then purchased for a nominal sum and restored with the help of grants by the Trust, bringing back to life a building which though it appears very plain externally, provides an ideal space for the museum. The main aim of the Museum of Islay Life is to "conserve and display items illustrative of life in Islay from prehistoric to recent times". Over the years since its opening it has gone from strength to strength, and it has received considerable support from islanders who have donated material of all kinds, bringing the museum's collection up to 2,700 objects; over 1,200 books; and nearly 5,000 photographs. The success of a museum cannot be measured in terms of the numbers of objects it owns or displays. What is important is whether it is able to present its material in a way that leaves its visitors feeling they have made a genuine connection with the people who once owned, made, or used the items on display. The Museum of Islay Life succeeds both in terms of the sheer scale of its collections and in their arrangement and presentation. Especially good are the labels on the objects on display: small enough not to intrude, but large enough to be clearly legible to visitors, and with just the right amount of information. You enter the museum past cannon barrels and other artefacts, and via the porch in the gable end. Much of the museum can be glimpsed as you enter, while above you is a gallery used for office and storage space. The stone walls, good lighting and white ceiling combine to make this an ideal space for a museum. At the far end a doorway leads through to what was originally the vestry. This is home to the museum's Gordon Booth Library, a collection of books and papers about the island; to a display of a few of the collection of old photographs of Islay; and to items as diverse as a dolls' house and a bathchair. But there is a great deal to see before you get as far as the vestry. Parts of the museum are given over to recreations of rooms, including a bedroom from Islay House, and rather more humble accommodation in the form of a kitchen and a box bed of the type that would once have been common in croft houses. Elsewhere are displays of dresses, military uniforms, and more. No two people exploring a museum will ever have quite the same experience because no two of us enter with quite the same set of interests and expectations. Any account of highlights must therefore necessarily be a personal one. And there are many of them. Some of the nautical memorabilia is especially striking, ranging as it does from small models of ships and photographs of all the ferries that have served the island to the ship's bell from the SS Tuscania, one of two troopships sunk off the Mull of Oa in south west Islay in 1918. The hundreds of US servicemen killed when the ships were lost are commemorated by the American Monument, which though ten miles to the south is just about visible from the entrance to the museum. 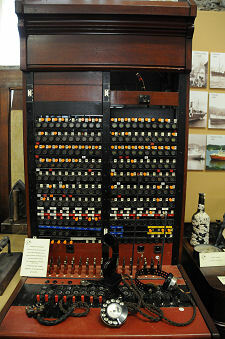 Another notable exhibit is a large manual telephone exchange, looking for all the world like something out of a 1930s film. It comes as a surprise to discover that this was in use on Jura until 1974. Others might be drawn to the marine engine on display, or the illicit still we've already mentioned. 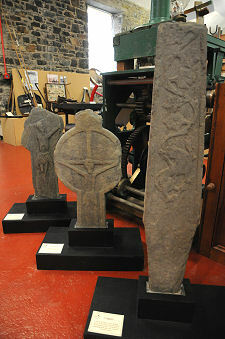 Many visitors will find some of the most fascinating exhibits to be superb collection of early carved stones which have been found on Islay over the years. 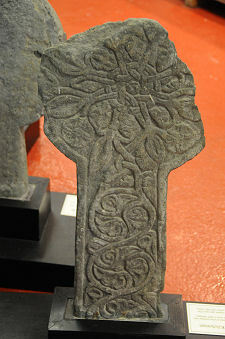 One dating back to the 1500s has a carving of the crucifixion and there are others of a similar date or earlier. The way the stones have been displayed adds much to their interest, and we were especially pleased to be able to see both faces of many of the stones. And once you have visited the museum itself, make sure you don't overlook the shelter built at the foot of the churchyard, backing onto the main road. This is home to a further collection of carved or interesting stones which have turned up in different parts of the island. For obvious reasons the very best stones are those on display in the museum itself, but the range and number in the shelter helps to bring home the sheer depth of early culture on Islay. Especially interesting is a burial cist found in 1974 and some fine early carved crosses and cross shafts. Isle of Islay, PA48 7UA.